I got to visit MoMA this past week in New York. I knew this iconic museum in New York had celebrated the artistic nature of a number of products over the ages, from the Movado watch to the iPod. But to turn the corner on the "design" floor and see not one, but six example's of Jerry Manock's designs sitting there, was a little surreal. 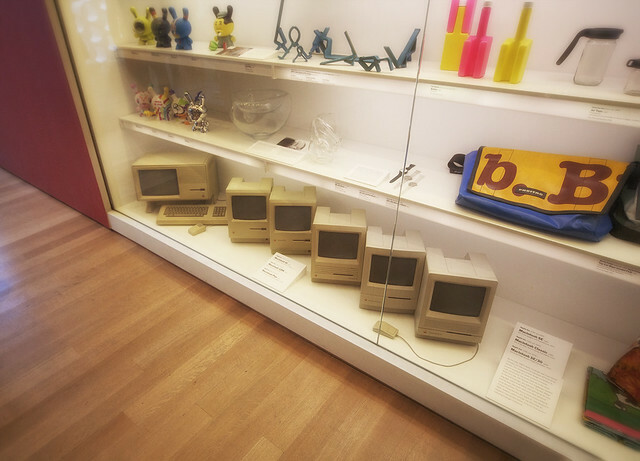 It's affecting because you knew when you first saw the Lisa and then the original 128KB Macintosh at the store in 1984 that… well… what was before you was the future, and the future was cool. It was cute, it was graphical, adn damn, it had a mouse. It was excellent design. And you knew it when you saw the original iPod and it's click wheel. I am not sure how I feel about seeing a computer, a tool, in an art museum. But it is a nod to the vision of Mr. Jobs. Some art is meant to be used as tool, as fashion. And yes - we may like some of these tools for their aesthetic nature, even if they're mass-produced. It's the design that's on parade, not the tool.